MDEQ caused this crisis to happen. When confronted with evidence of its failure, MDEQ responded publicly … with a degree of intransigence and belligerence that has no place in government. These failures are not diminished, nor should focus on them be deflected, by the fact that other parties contributed to the disastrous decisions or the prolonging of the consequences. Primary responsibility for the water contamination in Flint with the MDEQ. 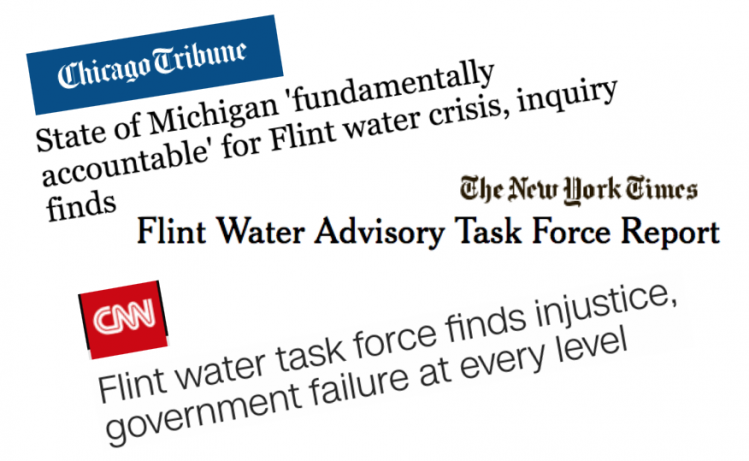 In addition, at the time of the water crisis, Flint was under the control of state appointed emergency managers, who made key decisions that contributed to the crisis. Because of these two facts, the state is fundamentally accountable for what happened in Flint. This accountability needs to be enforced and the task force made a number of recommendations to do that. The public health crisis in Flint demands a comprehensive response. Michigan Department of Health, Genesee County of Health and local health care professionals must exert all efforts to insure 100% clinical and environmental follow-up with Flint families. The resources need to be made available and the effort needs to be made to assure that everyone in the community who needs them takes advantage of them. That is why the task force recommended that Michigan DHHS establish a Flint Toxic Exposure Registry to include all children and adults residing in Fling from April 2014 to present. This would be a critical step toward a comprehensive health study to examine the impacts this has had on the population of Flint. This in turn could be part of the “comprehensive Flint public health program” which has been recommended to provide assessment, interventions, and support not only regarding the health effects of water contamination, but more broadly, the health effects of chronic economic hardship and other social determinants of poor health. There is an opportunity to turn the tragedy of Flint into something positive. A comprehensive public health program “can serve as a model for population health across the state” and, indeed, the nation. Communities around the country are threatened with toxins in drinking water. Let’s use the focus on Flint to create an action plan that all communities can follow to cleanse themselves of the harm of contamination.